What Color is His Bathroom? By the Way, What's Your Favorite Holiday? I walked my son to school last week and happened upon a teacher struggling with two hands full of heavy plastic grocery bags. Knowing how those thin, tough handles love to cut into flesh, I offered to carry some for her so she could unlock her door. We ended up talking the WHOLE FIRST PERIOD of school about holidays, their meanings, and the way people perceive them. (Yep, I can talk to anyone.) I once got involved in a conversation with a stranger in the visitor's center at Flaming Gorge. When I finally got in the car with the impatiently waiting males of my family, my husband glibly asked, "What color was his bathroom?" Im also thankful to have launched my new pen name blog! Do you wanna see? Really? If you follow it, then you get to read TWO blogs from this infathomable mind of mine. (Which goes along with the gratitude-for-my-face sentiment. I'm glad I have any mind at all.) Can you take it? CAN YOU? 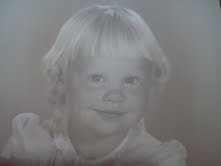 Be one of the first to click to visit SkyleeFair.blogspot.com! When I last saw my doctor and proudly reported that I walked my dog 10-15 minutes a day, old Doc Nay raised his eyebrows and said, "If you upped that to 45 minutes a day, you'd get greater benefits." or walking on the streets of my town. What I have learned is that if you walk on a walky thing in your living room, it's very easy to step off "just for a minute" to go get something to cool you down... say, a dish of ice cream... and then answer the phone and run to the post office before it closes and deal with a child's emergency and ultimately fall into bed without getting back on the walky thing. On the other hand, when you walk on the street a certain distance from home, there is no alternative but to walk that same distance back in order to reach the freezer and bowl and spoon, thus getting in the desired walking time. This means something profound. It could be that you've just got to get yourself far away and then write yourself home. What do you dedicate yourself to completing? How do you reach your goal? (Shirley) Thank you for coming to the cemetery today. Sorry about the rain, but at least we’ve got my big golf umbrella to stand under. I love the sound of rain. One thing I don’t love is reading cliché “conversion stories.” They make me want to gag on my Postum. 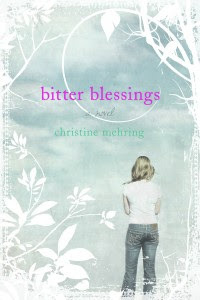 “Bitter Blessings” may be classified as a conversion story, but I think it is so much more. For one thing, it’s not sappy. It’s actually more like a delicious mystery, with a compelling twist that I did not see coming. Each character is true to their role, and the protagonist, Megan Randall (did I spell that last name right :o)?) is not a perfectly-picked-on Cinderella. But hold on! This book is not without its lighter moments. I had to laugh out loud when Megan’s friend, Adam, described some prom dresses he’d seen in a catalogue with a shudder and the words, “There was lace and big bows and poufy skirts.” Having raised six sons, I can just hear the perplexed and dismayed tone in his voice when uttering those words. Well, well, look who’s coming. If it isn’t Christine Mehring herself. Look out for that headstone, Christine. Here, get under this umbrella with me. (Christine) Hello, Shirley. I'm so glad you were willing to meet me here today. Most people get a little skeevy when they find out how much I enjoy walking in the cemetery but I think the atmosphere here is just dense with stories, and besides, it's quiet and people tend to leave you alone. (Shirley) Especially if you're standing in one spot, reading headstones. Hey, I have to wonder, have you ever lost anyone close to you? (Christine) Only my grandparents, all of whom were dear to me, and very elderly. So far, the rest of my family has been kind enough to stick around. (Shirley) That is nice of them. Your description was so close to the heart that I’m curious just how this story developed in your wondrous little brain. (Christine) I just have a slightly overdeveloped imagination. :) Actually, I start stories with what amounts to a couple of snapshots in my head - a beginning scene and an end. Watching my characters get from point A to point Z is what makes everything worthwhile. As the story developed, I realized I wanted to accomplish a couple of things with it. First, I wanted to write LDS YA fiction that would have appealed to me as a teenager. I read a lot as a kid, and I wanted to like LDS fiction, I really did, but I always left it feeling like, well, let's just say that Polly Perfect Protagonist and I didn't have much in common. Second, I wanted to explore how a "typical" LDS family would handle the need to share the gospel in a situation where they couldn't just bear a testimony or offer an invitation to church. (Shirley) Well, it really worked. From the greenish thumb that sends tendrils through your book, I’m thinking that you probably have a fern at home, or did when you were a child. I loved your description of lying on the floor and looking up through the fern’s branches and feeling transported to another place. Are you quite the gardener? (Christine) I am an outdoor gardener only. I've actually had my license to own houseplants revoked due to criminal neglect. My mother is the queen of houseplants and the ferns belong to her. (Shirley) Hey, look, the sun’s coming out. Let me just move this umbrella… oh, sorry, I didn’t mean to dump that water down your neck. It’s almost like going swimming in the waters around French Polynesia, isn’t it? No? How do you know, have you ever been there? (Christine) I haven't ever been there. My imaginary self is an accomplished sailor who spends at least half of each year blissfully island hopping. Unfortunately, my real self gets seasick in the bathtub. Maybe someday my imaginary self will tie me up, buy a boat, stock the hold with Dramamine and off we'll go. I'm keeping my fingers crossed. (Shirley) How are you at crossing your toes? Oh. Never mind. That makes your eyes cross, too. No matter. It’s so nice to feel the warmth of the sun and the warmth of love that you so skillfully wrote at the end of your novel. I do hope this cemetery doesn’t mean that this is the death of your writing career. (Christine) I hope not. It certainly isn't the end of writing, or the end of killing characters off. I'm currently working on a murder mystery for the LDS adult market. It deals with a woman who comes back to her small hometown after a long absence just in time for the suspicious death of a person she used to know. I love complicated characters with buckets of motives, secret personal agendas, quirks, conflicts, doubts, and deeply held convictions. Mysteries seem to be my natural home. No matter which genre I choose to work in, there's always going to be a puzzle to solve. (Shirley) Oh, look, our ride is here. Hm. There’s only one seat left up front. I’ll take it. You go ahead and ride in the back where you can stretch out. Go on, there’s plenty of room, all the coffins have been unloaded. That’s what you get for killing off your protagonist’s families. There you go. Nice and comfy? Good. Let’s go out to eat. What do you say to some good old all American hospital food? (Christine) Sounds good to me. Can I have your jell-o? My son grabbed a piece of leftover Halloween candy and declared, "I like the eyeballs, but the toes are too thick and chewy, just like real toes." (How does he know? Has he chewed on any toes lately?) 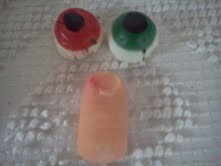 I thought it was hilarious that he was choosy about which body parts he ate, so I braved the senses and ate a toe. It was chewy, and thick, and had a hard part where the toenail was supposed to be. But it was sugary, so I chomped away. What's the saying? "More for me." Who's to say what's good to eat? It all depends on what you grew up with and what your tastes are. 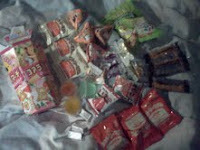 It was fun when my son shared some candy his friend brought back from Japan. 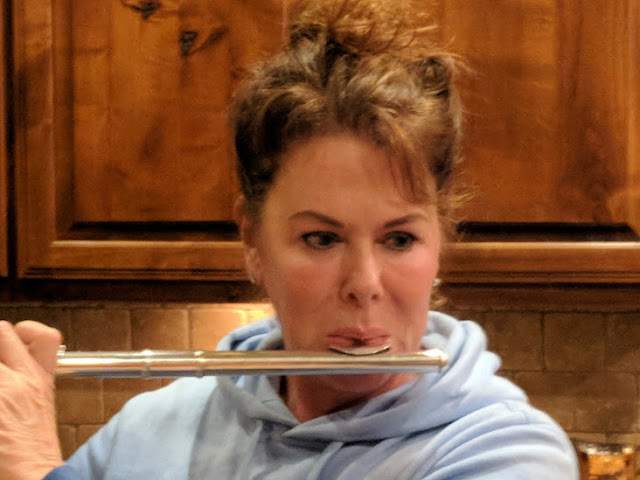 There were pieces that tasted like cough drops that one son really liked, and ones that were spicy that another boy liked, and the jello candy and the cookie bear candy. 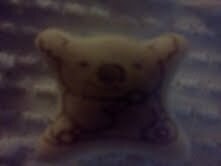 They were good, but better if you didn't look at the sweet koala bear faces before chomping down. It makes me think of koala revenge in the dark, scary night when you hear noises and aren't sure what they are. What could they be? Koalas marching in your nightmares, wanting to eat your eyes and toes! Ahhhh! When my son asked if he could cut his own hair, I said, "Sure!" I mean, more time for me, right? I tend to be a permissive parent, letting my sons eat peanut butter and baloney sandwiches and wash their own laundry, even if it meant they wore wrinkled Sunday shirts. When they got old enough to care, they handled their laundry differently. Experience is usually the best teacher. When I heard my independent barber son use a water spray bottle in between bouts of the buzzing hair clippers, I called through the door, "Clippers like dry hair better." "But they aren't working," he answered. "Maybe we need new ones," I said. But it was too late. Several minutes later, he said, "I'm bald." Well, some spots were bald, but other spots weren't. So I used my Magic Mom Moves to even out his haircut. Yes, he still has hair. Being blond, it's hard to see. 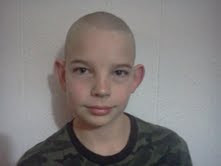 Once his 18-year-old brother caught his breath from laughing, he told him he looked just like Aang from "The Last Airbender." 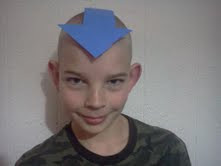 Then he made a blue arrow like Aang wears on his cartoon head. Michael took the arrow to school with him. Who knows? He may wear it until his hair grows back. What kind of fashion/design/social faux pas have you experienced? Aw, Marsha Ward is so nice to say my blog is lovely! 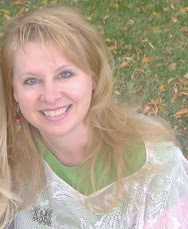 CLICK RIGHT HERE to see how lovely Marsha's blog is! 2. I love Halloween, although I've been accused of wearing costumes even when it's not Halloween. 5. I can say the alphabet backwards. I can say it fast. I can do it in one breath! I can annoy anyone you want me to annoy with this skill! 6. I've liked blue cheese salad dressing ever since my first taste of it when I was a pre-schooler. 7. I forget people's names unless I hang around with them a lot, see them often, or they remind me of one of my family members. Because of this, I often have the delight of re-meeting fabulous and interesting people. (Which may very well be you!) Be patient with me. It's nothing personal. 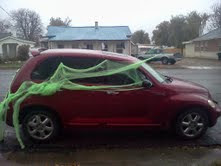 THANKS to my 12 year old who made sure my car was dressed up for Halloween.